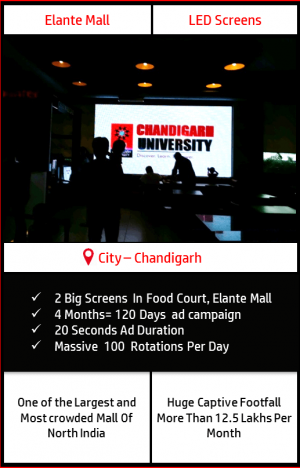 An Advertisement Campaign on BIG LED Screens at Food Court, Elante Mall, Chandigarh which is one of the largest & most crowded Mall of North India. Highly recommended Advertising Package for Universities, Colleges & Educational Institutes this Admission season. Strategically Structured & Located 2 LED Screens targeting the entire food court. 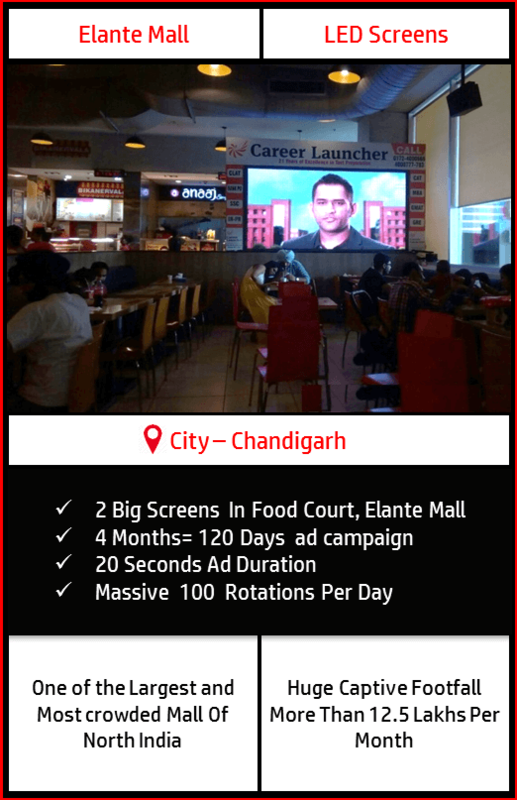 Extreme Branding With 20 Seconds Ad, Massive 100 Repetitions Per Day Combined on both Screens. Take The Live Experience Of This Unique Synergistic Advertising Medium. Watch The Video. Explore more About The 2 BIG LED Screens By Downloading The Presentation Here. Quite flexible medium in which Multiple ads can be played one by one. Hence, an effective advertising medium giving clients the privilege to convey their entire message properly. The Brands associated with the exclusive media grabs a Huge Brand recall as visual repetitions are on extreme hike while people having their leisure time. Huge ROI (Unconquerable medium among all medias in town). 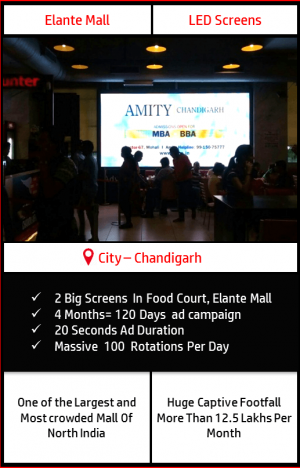 A Special Package with Best LED Screen Advertising rates In India. Extremely fascinating & engaging content keeps people entertained all the time. Elante is a place where Huge Number of Students visit along with their parents and spends a quality family time exceeding 1 hour minimum. The most strategic campaign especially built and customized for educational institutes to target students as well as the head of Families. Universities aiming Chandigarh and Punjab as the target market can reach massive students crowd in this admission session. All in all the best University marketing campaign. Elante is the second largest mall in North India and third largest Mall in India with the retail space of over 1 million sq. ft. having G+3 levels. Topmost national and international brands resides here under the same roof along with a proper mix of hypermarket, departmental stores, Sports Bar & much more. 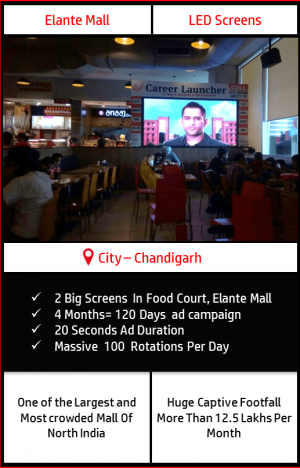 Elante Mall is exactly replica of the phrase “Entertainment, Entertainment & just Entertainment” which provides strategical & well established entertainment zones, multiplex and food court to cater to its customers. The 2 BIG LED Screens in Food Court is just like a cherry on the cake which takes entertainment to the supreme level for the crowd visiting Elante Mall . The mall witness a mammoth footfall every day which keeps the development the most happening place in the Tri – city . Hence, concluded as a must preferred location for the advertisers seeking to cater a huge crowd to give their brand a grand visibility.